We haven’t had many product reviews up here, mainly because there haven’t been all that many products that we’ve loved enough to share with you. This one is an absolute winner though. Anna and I found this unassuming little bottle at a train station kiosk in Swindon and have been converts ever since. Everyone knows that washing your hands is very important to keeping healthy. But nowadays it is more generally accepted that hand sanitiser is not great for you or the environment. It contains strong antibacterial and antimicrobial agents, like triclosan, which are not only harmful to the environment, but are also leading to the growth of resistant strains of bacteria. 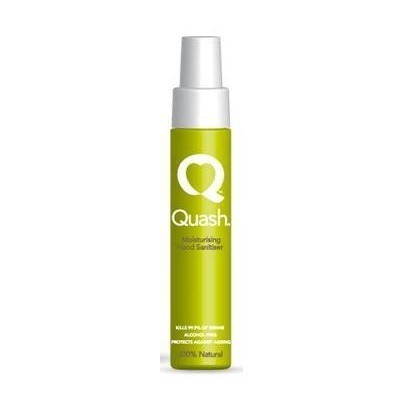 Quash is a form of hand sanitiser that is made with 100% natural ingredients (including manuka honey, willow bark, aloe vera, vitamin C, white tea and lavender), is alcohol free and kills 99.9% of germs. It leaves your hands soft and doesn’t smell or taste awful if you happen to eat something afterwards. We’ve been using it for months and can’t imagine going back to normal hand sanitiser. P.S. Quash has no idea we’re writing this – it goes without saying that all our opinions are our own.